The report segments the offshore pipeline market, by line type, into export line, transport line, and other line. The transport line segment is expected to hold the largest market share by 2023. Approximately 25,000 km of transport line pipeline network is expected to be completed from 2018 to 2023. Europe, followed by Asia Pacific and the Middle East, is expected to be the most attractive region in this segment, during the forecast period. Major contractors include companies such as National Petroleum Construction Company, Technip, Saipem, and Europipe. The offshore pipeline market, by product, is segmented into oil, gas, and refined product. The refined product segment is expected to dominate the market by 2023. 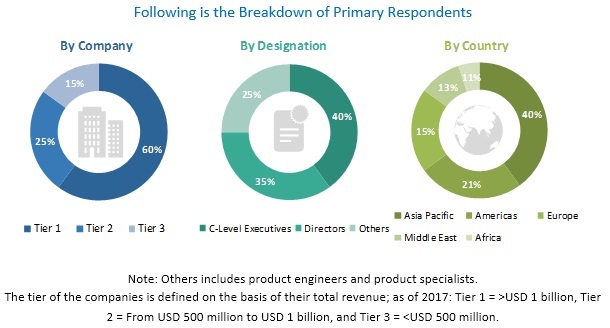 The increasing demand for refined products, especially from the Asia Pacific region is driving the market followed by the Middle East and Africa. The greater than 24” segment is expected to grow at the fastest rate during the forecast period. Approximately 35,000 km of 24” pipeline network is expected to be completed from 2018 to 2023. The European region, followed by the Asia Pacific and Middle Eastern regions, is expected to be the most attractive in this segment, because of the commissioning of planned projects during the forecast period. Major contractors include Saipem, National Petroleum Construction Company (NPCC), and McDermott International. 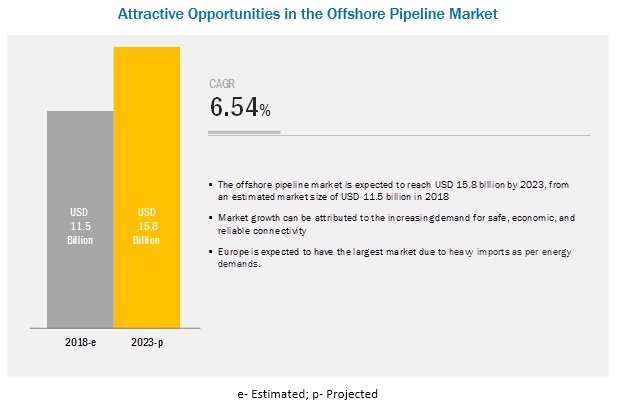 The major players in the global offshore pipeline market, are Saipem (Italy), Subsea 7 (UK), McDermott (US), Sapura (Malaysia), Wood Group (UK), Technip (UK), Fugro (Netherlands), Atteris (Australia), Penspen (UK), Petrofac (UK), and Senaat (UAE). In January 2019, Saipem was awarded 2 EPCI (Engineering, Procurement, Construction, and Installation) contracts by Saudi Aramco for the offshore field development activities like laying of pipelines and subsea cables. In December 2018, Saipem was awarded a contract for offshore Engineering, Procurement, Construction and Installation (EPCI) activities of the Zohr Field Development Project for 30-inch diameter gas export pipeline in deep water (up to 1700 metres) from Petrobel. In December 2018, Subsea 7 Integration Alliance was awarded a sizeable flowlines contract by BP for the Manuel project in the US Gulf of Mexico for well development. In December 2018, McDermott and BHGE came together as development partners for the Equus Gas Project in Australia. This Western Gas Collaboration will provide an integrated solution to develop the entire field covering drilling, subsea, production facilities, export pipeline, an LNG facility, and a domestic gas connection. The report identifies and addresses key markets for offshore pipeline, which would help manufacturers review the growth in demand. The report addresses the market share analysis of key players in market and with the help of this, companies can enhance their revenues in the respective markets. 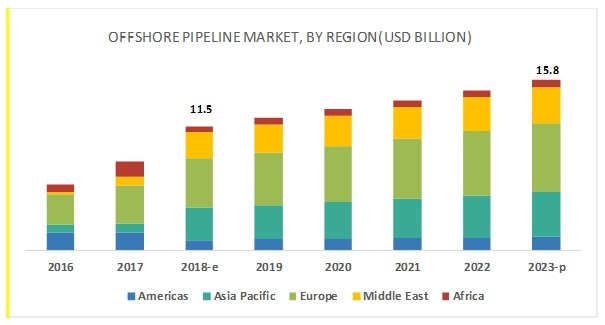 The report provides insights about emerging geographies for offshore pipeline and hence, the entire market ecosystem can gain competitive advantage from such insights. The study involved 4 major activities in estimating the current size for the offshore pipeline market. Exhaustive secondary research was done to collect information on the peer and the parent markets. The next step was to validate these findings, assumptions, and sizing with industry experts across the value chain through primary research. Both top-down and bottom-up approaches were employed to estimate the complete market size. Thereafter, market breakdown and data triangulation were used to estimate the market size of the segments and subsegments. In the secondary research process, various secondary sources such as Hoovers, Bloomberg BusinessWeek, and Dun & Bradstreet have been referred to identify and collect information for this study. These secondary sources included annual reports, press releases & investor presentations of companies, white papers, certified publications, articles by recognized authors, gold standard & silver standard websites, regulatory bodies, trade directories, and databases. The offshore pipeline market comprises several stakeholders such as consulting companies in oil and gas, government and power research organizations, oil & gas operators, pipeline manufacturers, and EPC (Engineering, Procurement, And Construction) companies in the supply chain. The demand side of this market is characterized by the number of projects for offshore pipelines in upcoming years. The supply side is characterized by the installation of the offshore pipeline. Various primary sources from both the supply and demand sides of the market were interviewed to obtain qualitative and quantitative information. After arriving at the overall market size from the estimation process explained above, the total market has been split into several segments and subsegments. To complete the overall market engineering process and arrive at the exact statistics for all the segments and subsegments, data triangulation and market breakdown processes have been employed, wherever applicable. The data has been triangulated by studying various factors and trends from both the demand and supply sides. Along with this, the market has been validated using both the top-down and bottom-up approaches. Saipem (Italy), Technip (UK), Subsea 7 (UK), Petrofac (UK), McDermott (US), Sapura (Malaysia), Wood Group (UK), Fugro (Netherlands), and Atteris (Australia).